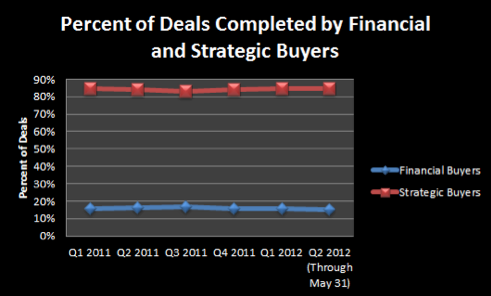 Since the beginning of 2011, the proportion of deals completed by Strategic buyers versus Financial buyers has stayed fairly constant as demonstrated by the chart below. 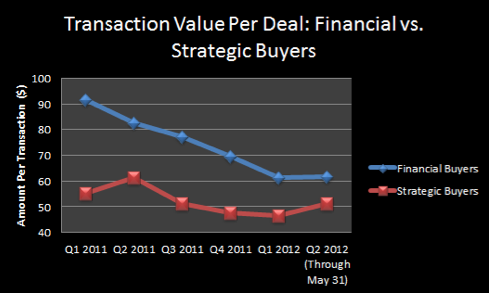 One statistic that has changed, however, is the total transaction value per deal, which started to decrease after reaching a high in Q2 2011. The record low for the last 17 months was in Q1 2012. If one analyzes average transaction value by type of buyer, for Financial buyers, it has decreased from $91.76MM to $61.82MM over the last 17 months. For Strategic buyers, average transaction value has decreased by a much smaller amount, from $55.16MM to $51.32MM in the same time period. As you can see from the chart below, this statistic is trending upward over the last few months for Strategic buyers, but remaining flat for Financial buyers. Financial buyers are paying less per transaction now versus 17 months ago. We believe that this trend is the result of credit markets that remain unstable, causing leveraged buyouts to be more expensive and complex. Typically, Financial buyers pay less because they have to generate a return on invested capital, without the benefit of synergies. The chart above also demonstrates that the average value that Strategic buyers are paying per transaction is not decreasing because of companies’ desires to either make offensive or defensive acquisitions and because of their ability to derive synergies. When Strategic buyers make acquisitions, they are often able to recognize both revenue and cost synergies. Revenue synergies occur when the buyer can sell its products through the target’s sales force, and vice versa. Cost synergies occur when the buyer can reduce costs of the combined companies by eliminating redundant costs. As a result of the trends mentioned above, we expect the average price per deal will increase over time. Strategic buyers will continue to use their large cash balances, which are reported to total US$850 billion for US companies, to make opportunistic and synergistic acquisitions, and Financial buyers will need to pay more for deals, or they will risk losing an increasing number of deals to Strategic buyers.